I started my blog over a decade ago and at its (my?) height of popularity I had been the subject of stories in the Globe and Mail and on CBC Radio and was a panelist for the National Post's "Canada Also Reads" (an answer to CBC's "Canada Reads"). I pissed off some folks who worked at a literary journal based in Toronto who subsequently tried to steal my identity for a while. I got to interview Michael Crummey. I was asked to be a panelist at a writer's festival. And I had a fair share of regular followers, some of whom became "real life" friends. Nowadays my numbers are way, way down. I'm lucky if I get a comment a week. I blame this on a few things: Goodreads mostly, which has usurped for better or worst book blogs, the decline in blog popularity in general, my own lack of blog hopping, and my switch to talking predominately about graphic novels which may have alienated some of my readers. I don't care too much. When I first started the blog it was borne out of frustration that I couldn't find an actual book club in the small town I was living in and just wanted to talk with people about books. However, I've since come to just appreciate the journaling aspect and do it more for myself than anything else. That said, I'm still cognizant that it's out there for anyone to read at anytime. And that my name is attached. This is important to note as it dictates a lot of what I say or don't say. I always felt that it's a bit cowardly or naive to hide behind a pseudonym online. Attaching my name keeps me in check. Before I say anything that could be construed as controversial, I have to consider if I'd be willing to back it up with those who might challenge me. I have to consider my employers and loved ones (or enemies!) who know me. But with that in mind, there's also the question of authenticity. I try to be honest with my opinions, but I also try to spare feelings some times. I live in a relatively small city and the literary community is even smaller. If I don't like a local author's book, how do I balance that against wanting to be the Northern book blogger? I have to comment on it, right? Despite having my name attached, I've never broadcasted having a blog to people I know and when people I know reveal that they've read my blog I always feel awkward and a little panicky. When my parents mentioned that they discovered it I nearly had heart palpitations. I'm much more liberal and open-minded, I would think, than they are and while my blog reflects that I don't care to get into big debates with them. (Too much of a chicken?) Fortunately, I don't surround myself with many that like discussing books as much as I do, and very quickly such acquaintances lose interest in my blog and I rest a little easier. My mother's only comment was that I like to use "big words." She's not mentioned it again in years. Even with this awareness of outside readers and associated possible repercussions, I've had moments that I'm not proud of. There was one case when a writer in Newfoundland had been a regular follower of my blog but under an assumed name. She was also attending all the local writers festivals and schmoozing. Then she released her first novel and I really didn't like it. I was also flabbergasted that it was getting good reviews from fellow local writers. I believed at the time that she had been only schmoozing for this very reason and someone needed to give an honest review. I was definitely too mean, too tactless in my review. First off, why shouldn't she schmooze? Second, it was her very first novel. Third, she wasn't using her author name when visiting my blog, so there goes any theory that she had only been visiting to ensure I'd be nice. I wasn't being used. Other regrets come from a couple of reviews I did of Inuit writers. In one I felt that another reviewer had only given a book a good review because she was putting the culture upon a pedestal when to me the book in question was "crazy." I still, in hindsight, don't "get" that particular book, but perhaps I, as a white person who didn't grow up in the north, wouldn't immediately "get" it and that's okay. I maintain, however, that the reviewer I had questioned was also a white southerner, and so neither one of us was in a position to review without bias or with real understanding. There was another local Inuk poet who's work I didn't appreciate and I suggested that it seemed as though she just threw random thoughts on a page to see if any sounded poetic. When a fan of hers countered that it had just been a poetry journal she had kept that she hadn't intended to ever publish, I argued that the publishers shouldn't have. I've since come to realize that we don't have enough diverse poets being heard and I do think they should have. As a very long intro to talking about Kerry Clare's Mitzi Bytes, it should also serve as a sample of the many personal reflections I had while reading it. 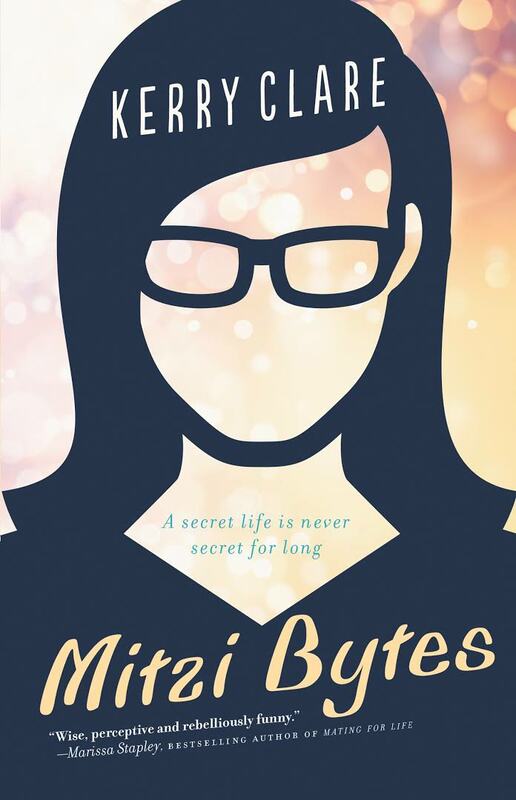 Mitzi Bytes revolves around a woman named Sarah Lundy, who has run a wildly successful personal blog for years unbeknownst to those around her. Mitzi is her secret identity. However, an angry email threatens to blow the whole thing wide open if she doesn't quit. Whereas the parallels and differences to my own blogging experience should by now be evident, I don't think Mitzi Bytes is only relevant to other bloggers. We've only begun having the long overdue conversations about the effects of the internet and social media upon society and Kerry Clare has served up a wonderfully balanced look at this complex reality. I found it especially interesting to also be reading Roxane Gay's Hunger at the same time. In Gay's book she digs deep into personal traumas and familial relationships. I wondered how her family responded to her book and her portrayal of them and this also made me realize that in one sense Mitzi's story is not a modern one. Yes, her observations were published on a blog, but like Gay, people have been writing down their observations and opinions of other people in book format for years, for centuries. Still the immediacy and availability of publishing that came with the internet certainly affects things dramatically. Of course, Clare could have delved into this discussion in non-fiction but that wouldn't have been nearly as compelling as it turned out. It works largely in the first in the first half of the book as a bit of a mystery. There are many potential blackmailers and figuring out the culprit and his or her motivation kept me hanging on. I'd also give credit to Clare's deft hand at portraying flawed characters in authentic situations. Most readers will be like me, I suspect, and flip back and forth to whether or not Sarah was in the right. On the one hand, she doesn't give anyone's name away in her blog posts, people talk about others all the time, and often her observations are made in order to philosophize and discuss higher themes. On the other hand, when reading some of these blog posts, it's obvious that some are quite judgemental and to those that would recognize themselves, no doubt hurtful. Even then, does she deserve the hate? I will be mulling over this book for some time. But yes, I think that this is all something we've thought about, and worried about; and Mitzi Bytes brings up some of those struggles too. I don't know if "enjoyed" is the right word for this post, but it certainly made me think! Interesting thoughts. I actually saw Ms. Clare give a reading and interview of her book, so it is on my TBR pile, though not particularly close to the top. I don't run in literary circles, so I don't have to censor myself that much on that account, though I try not to be cruel. Still someone once left a comment that I knew nothing about Canadian poetry and was an idiot who couldn't do close reading either, but I didn't publish that one... As for more political posts (since I don't only post book reviews), I usually wait at least a day or two to make sure I really want to put something out there. I have pointed a handful of co-workers to specific blog posts, so I know they know it is out there, and that acts as a bit of a constraint as well. It does seem to be the case that blogs are in a bit of a decline these days as people don't have the patience to read more than a few sentences. Too bad.